Rediff.com » News » Can Modi unshackle Indian genius? Can Modi unshackle Indian genius? Rajeev Srinivasan on how India has continued to disappoint, but could outdo Singapore one day. In 2007, I wrote about how I had become disappointed by India: We had formal independence, but not freedom. This year, I am guardedly optimistic, because of obvious reasons: The victory of Narendra Modi, the one man who has the will and now the means to make a clean break with the Nehruvian Penalty of the past 67 years. Yet, I am a little worried about two things: One is the weight of expectations that the prime minister carries, which he will be hard pressed to deliver, even though he did make a stirring speech from the Red Fort. In fact, I once read the suggestion somewhere that the Statue of Liberty in New York should be balanced by a Statue of Duty in San Francisco Bay. Similarly, I think the new Sardar Patel statue should be positioned as India's Statue of Responsibility, whereby each citizen should think it necessary to do his duty to the nation. How many know that there are Fundamental Duties in the Indian Constitution, in parallel to the Fundamental Rights? By the way, for those from two sides of the tracks (Narendra Modi was poor whereas Kennedy was from a rich dynasty, as Joseph Kennedy made big money during America's Prohibition days), this is the second time people have compared the two: They both have charisma, although Kennedy also was famous for his boyish charm and weakness for beautiful women. The second worry I have is the weight of our handicap of the last 67 years: How far we have fallen behind, especially in comparison to Asian and European nations that have left us in the dust! This gap was brought to my attention powerfully when I went to Singapore recently, after a gap of maybe six years. I found them rehearsing for a big party next year to mark their 50th year of Independence. I also read an article in The Straits Times by elder statesman Kishore Mahbubani who wrote about '5, 500, and 50,000' that Singaporeans should consider when they express dissatisfaction. Mahbubani was referring to the fact that a Singaporean could have a meal for as little as SG$5, go on vacation for SG$500, and buy a house for SG$50,000. Well, the last would not be possible in extremely expensive Singapore (decent apartments will set you back several million dollars), but in one of its ASEAN neighbors that are much less affluent. In general, in 50 years, Singapore has joined the ranks of the rich, with no natural resources other than the brains of its citizens. According to the IMF, in 2013, Singapore's PPP GDP/head was US$64,584, #3 in the world. The US was at #6, with $53,101. For comparison, China was at #93, with $9,844. And India was at #133, with $4,077. And let us note these are PPP numbers. In nominal dollars, the gap is much greater. Singapore's nominal GPD/head is $55,182; India's is a mere $1,499, according to the World Bank, almost 40 times less. Ah, then there is 'yeah-but.' I expect various people to jump up and point out that Singapore is a small city State, not a sprawling subcontinent. This is a specious argument, as pointed out acidly by Atanu Dey (external link). In fact, a larger country has economies of scale that make it easier for it to prosper than a small, resource-poor island nation. Furthermore, what about Germany, Japan and South Korea, all rather large nations that suffered grievously from wars and have yet prospered? If they can, why can't India? And then there is the 800-pound gorilla: If China, a basket-case after Mao, and huge, can prosper, that should mean India could do at least half as well. Of course, you can make excuses: American support, and being in the right place at the right time, yes, did make a difference. But that's still not the answer. That's all they did. And the result has been dramatic. At the time of Singaporean independence, a Singapore dollar was worth about Rs 1.5. Today it is worth about Rs 50. That is, in 50 years, the value of the Indian rupee -- a fair proxy for national competitiveness -- has fallen by a factor of 35, which can be attributed squarely to the brain-damaged leftist policies of the Nehruvian Stalinists who were finally ejected from power this year. None of the things that Singapore did are easy to replicate, but they are not impossible either. Over and above everything else, it had a great leader in Lee Kuan Yew, who had the foresight to understand his nation's core competence, and put in place a structure around it. He and his core group imagined the future and planned Singapore's place in it. For instance, the civil service in Singapore attracts their best and brightest, and they are paid very well indeed, thus reducing the incentives to accept bribes. In addition to the carrot, there is also the stick: Harsh punishment, including floggings and hangings, for those who break the laws. This has created a law-abiding nation: One of the news items I read was about a man being sent to some 25 months in prison for fondling a young woman. Compare this to poor Nirbhaya; at least one of her tormentors got away with a light 'juvenile' sentence. Education, infrastructure, business-friendly laws: All this is textbook stuff that India must provide, of course on a much larger scale. Even the low-hanging fruit can make a quantum difference because India's situation is so abysmal. Then there is discipline. There is a compulsory draft, and every young person is required to join the army for some years: This is an excellent way of instilling a sense of solidarity with fellow citizens. Furthermore, the laws are so strict, and so well-enforced, that there are no rotting piles of garbage, people queue up quietly for the subway, and nobody spits on the roads or fails to flush a public toilet: Any one of these will attract a fine of SG$500 to SG$1,000! Finally, they have created a sense of Singaporean-ness, although the population is mostly Chinese and either Buddhist or Confucian. Ethnic minorities such as the Malays and Tamils are treated with respect, and so are religious minorities such as Christians, Muslims and Hindus. However, nobody bends over backwards for any group. I was there during the Muslim month of fasting, but there were no loudspeakers calling to prayer, nor any outward, public signs of religious fervor: It is treated, correctly, as a private affair. I was told that all Muslims had been given a portable radio some years ago so they could listen to the five-times daily call to prayer in private, without imposing on others. It is true that Singapore has had its dark side too. During the time that Lee Kuan Yew was consolidating his grip on power, he did harshly put down violent dissidents, often Communists, who were threatening to tear apart his country. I think he was clear about the social contract he had with his people: They behaved, and he helped them get prosperous. Again, it is not the case that Singapore is the long-term benchmark for India, but it is a short-term 'minimum winning goal.' For, Singapore has lost most of its cultural heritage, and now looks increasingly like a playground for rich Chinese -- gambling (intended for foreigners) is big business, and I am sure accompanying sins like prostitution have appeared too. So India should attempt to emulate the good there, including a work culture and respect for the diversity, without absorbing the bad. Given time, and leadership, India can emulate the success of Singapore. Prime Minister Narendra Modi may well be the catalyst that makes this happen. Some time ago, I suggested (external link) that Lee Kuan Yew was the best analog for Modi: Not Thatcher, Reagan et al. and that the Modi's social contract is like LKY's in Singapore. Does Modi have it in him to be the one that finally unshackles the creative genius of Indians from the dead hand of dirigiste Nehruvian Stalinism? 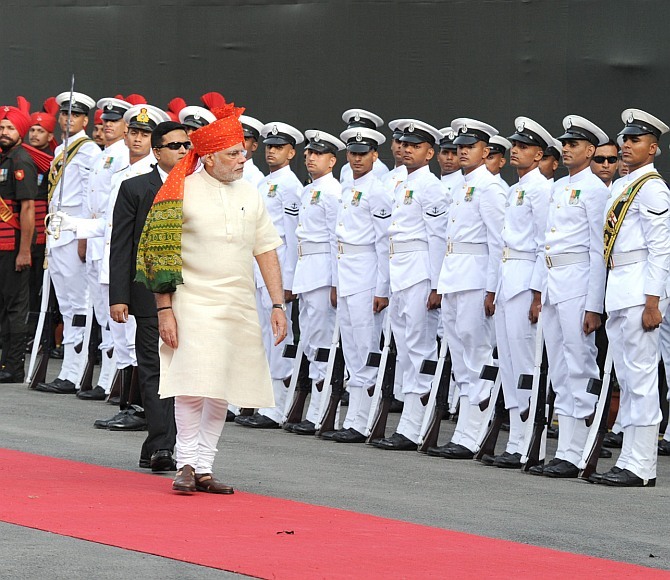 Image: Prime Minister Narendra Modi inspects the Guard of Honour at the Red Fort, August 15, 2014. Photograph: Press Information Bureau.